"The screen gives the bike a much 'sportier' look from the front, much like a Suzuki sportsbike, but is considerably shorter than the stock screen, with the top of the screen sitting just above the level of the mirrors. However the noise reduction is considerable, which was my biggest problem with the stock version …I think it looks pretty good." "I had the bike up to about 60 MPH this morning and the difference in noise levels between it and the stock screen is huge." Once I had got it set up to my height it works very well. 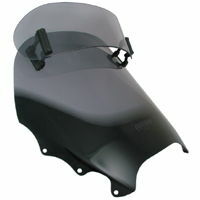 Much lower than the original screen, but still works very well, I can ride along with my visor up if I want to, plus I am no longer looking through my visor and having to look through the original screen (a right pain when it was raining and at night as visibility was impaired). On the whole very impressed with the quality and how well it works and excellent value for money." "I was really delighted to receive my Vario screen today and can only echo the comments of other purchasers of this product. It was out of the box, fitted in an hour and road tested. The bike feels much better balanced and the screen height is perfect. Great product!" * Please note these screens are manufactured to order, with approx. 7-10 working days delivery (non-refundable payment taken at time of order). 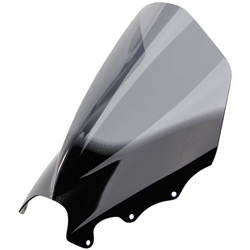 !quote, 56322, 4025066105250, windshields, wind, shields, windscreen, motorcycle, motorbike, sportsbike, vision, vario, touring, screens, vario-screens, vario-shields, gray, grey, tinted, smoked, ecran, vent, pare-brise, 01, 02, 03, 04, 05, 06, 07, 08, 09, 10, 11, 1, 2, 3, 4, 5, 6, 7, 8, 9, 2001, 2002, 2003, 2004, 2005, 2006, 2007, 2008, 2009, 2010, 2011, silverwing, fjs, 600, fjs600a, 600a, scooter, maxi, maxiscooter, super, superscooter! Received the screen on Wednesday, have it fitted but not yet tested. Hope it works as well as it looks.